This is a copy of the February 3rd edition of our weekly Newsletter, which we have been publishing since October 2015. It’s been an exciting month for cannabis stocks, especially the Canadian Licensed Producers, which bounced back sharply from a massive sell-off following the mid-October legalization. We wrote Friday about the 36% increase in the Canadian Cannabis LP Index, which is professionally managed by New Cannabis Ventures, detailing the performance across the three tiers of the market, with the nine companies in Tier 1 and Tier 2, those companies with quarterly sales in excess of C$10 million and C$2.5 million, respectively, significantly outperforming the 36 companies in Tier 3 with quarterly sales of less than C$2.5 million. Interestingly, Tier 2 outperformed Tier 1, meaning that the companies with quarterly sales between less than C$10 million but above C$2.5 million did better on average than those companies generating C$10 million or more of quarterly revenue. 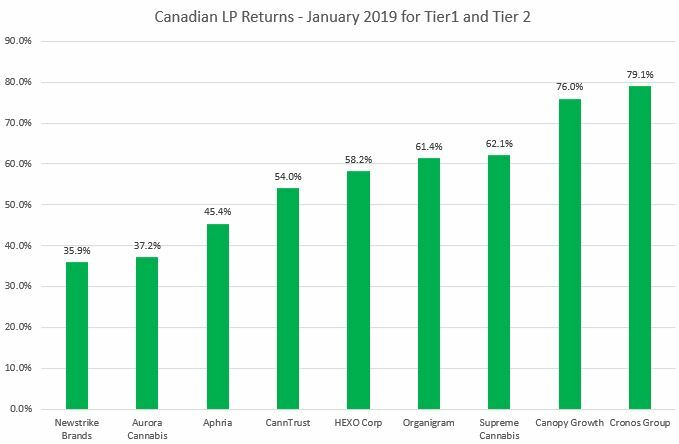 Tier 1 included Aphria, Aurora Cannabis, CannTrust and Canopy Growth, while Tier 2 included Cronos Group, HEXO Corp, Newstrike Brands, Organigram and Supreme Cannabis. For this month, Organigram graduated to Tier 1 following its disclosure of FY19-Q1 sales of C$12.4 million. The company expects that Q2 sales will increase at least 100% compared to Q1. We expect to see several companies boost their sales substantially this year following the ramping of their operations as well as the ability to sell into the adult-use market. While many of the companies have institutional analyst coverage, it appears that investors are reacting to the earnings news release as it prints rather than getting in front of it. Organigram had already guided to sales of at least C$12.4 million, so the report should not have been a surprise. 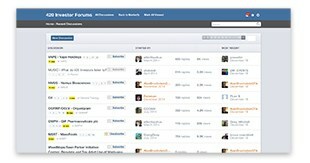 In fact, the results were slightly lower than the C$13.1 million consensus. Again, though, for those paying attention, the analyst consensus forecast for Q2 was already C$25.3 million (and has increased to C$27.5 million, according to Sentieo). So, if the market is liking revenue but is slow to price in future growth until it is officially published, there is likely an opportunity to benefit from researching the consensus numbers. We think it makes sense to follow the companies on the Public Cannabis Company Revenue Tracker and to be aware when they are reporting financials. If the precise date is known, we include it. Otherwise, we are providing the filing deadlines for these companies. Additionally, if the company has scheduled a conference call, we include it on the New Cannabis Ventures Earnings Calendar. It is probably worthwhile for investors to look beyond Tier 1 and Tier 2 to find companies that are expecting to be reporting substantial sales in the coming quarters. In a perfectly efficient market, this would not be a good use of time, as the stocks would be pricing it in already, but we believe the sector, with 47 publicly-traded companies, is anything but efficient. Finally, one caveat that we will share is that we expect the market to move beyond revenue as the key metric as the year progresses, with analysts and investors increasing their focus on cash flow and operating earnings. We anticipate that investors will be questioning management teams during the upcoming earnings releases about their outlook for profitability. Aurora Cannabis, for instance included guidance in its recent pre-announcement of its fiscal Q2 sales that it expected to generate positive EBITDA in the June quarter. For now, though, it appears that investors are keying on companies ramping sales aggressively. 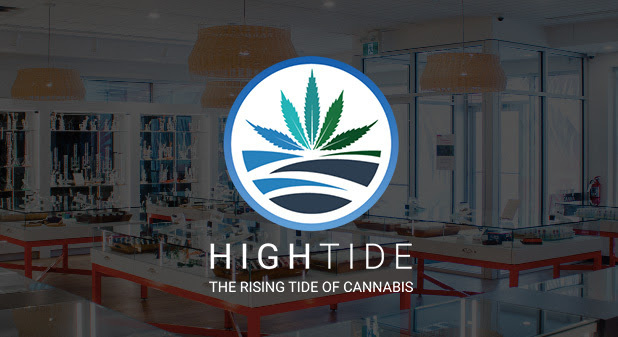 High Tide (CSE: HITI) is an Alberta-based public company that continues to roll up retailer-focused assets to position itself as Canada’s largest cannabis retail network. The company’s cannabis accessory operations have been in business for a decade covering six different brands that can be found online, in-store and wholesale. With a recent purchase of iconic online retailer GrassCity, and a $10M strategic investment into High Tide from Aurora Cannabis, the company is rolling out Canada’s most ambitious cannabis retail concept through both retrofit and expansion of its established footprint. To learn more about High Tide, a client of New Cannabis Ventures, visit the company’s Investor Dashboard that we maintain on its behalf and click the blue Follow Company button in order to stay up to date with their progress.